Our growing obsession with smartphones, and technology in general, has been negatively highlighted in different forms of media for a while. Sometimes it’s comedic, like showing someone behaving badly wearing Google Glass, or more serious like this popular short film, where smartphone users are chastised for not paying attention to the world around them. 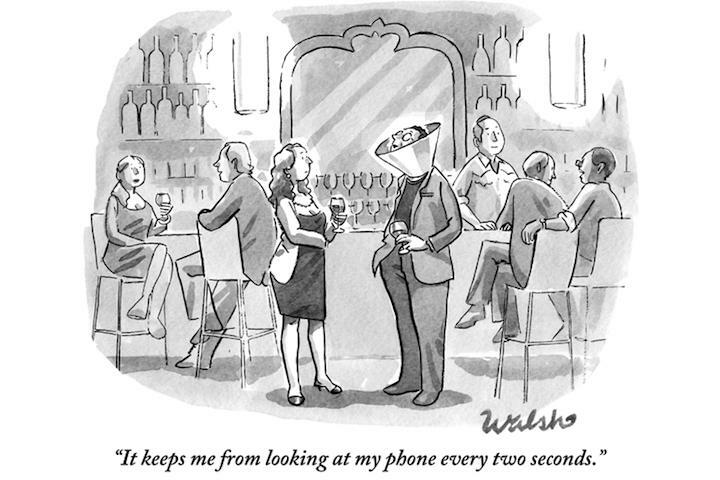 New Yorker cartoonist Liam Francis Walsh is also concerned about our relationship with smartphones, and has made it the subject of several cartoons that have attracted considerable attention. You can see an example of his work above. The cartoon depicts a man wearing a cone usually reserved for a dog that just left the vet. It’s designed to stop it from licking its stitches following an operation, but here it’s being used to stop the man from looking at his phone. 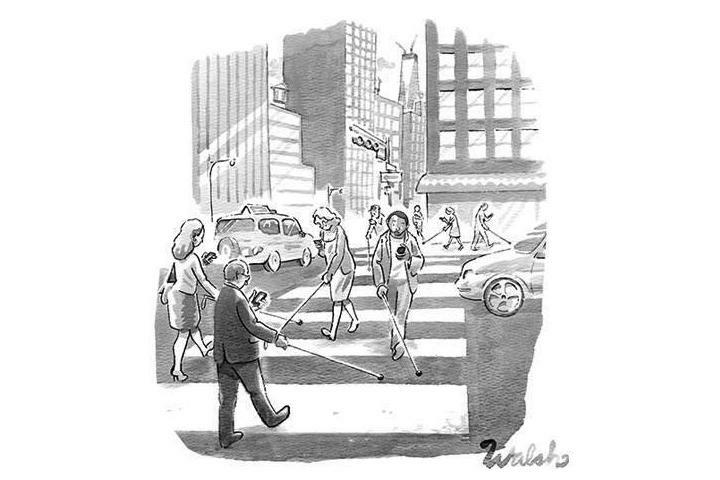 Another cartoon shows everyone with a smartphone in one hand, and a cane usually found in the hands of the blind in the other. It’s clever stuff, and a little too true. We spoke with Walsh, who describes himself as a late adopter of tech. Wondering if he sees our app-filled culture as the decay of civilization? He doesn’t. Walsh doesn’t hate tech, but recognizes it has both good and bad sides. “It’s about consideration,” said Walsh, who wouldn’t be caught dead texting while driving or messing around with his phone at dinner, but does think phones are great “for posting pictures of your kids, and for telling me where’s good to hang out in your city, too.” Just, again, don’t look at them during a meeting or while you’re friend is telling you he’s getting a divorce. Though he spends his time pointing out the shortcomings of society’s smartphone obsession, Walsh sounds like the best qualified to actually own one.